Jewellery is women’s best friends. Whether you like to wear it on a daily basis or once in a blue moon, every woman has some favourite piece of jewellery. Are you also one of those women who cannot get enough of buying jewellery, especially rings? If yes, then there is nothing wrong in this. Majority of the women cannot resist themselves from buying jewellery when they go out and confront a jewellery store. Do you also have a special place in your heart for rings? Nowadays, gemstones rings in Dubai and other places are gaining popularity. They look magnificent and charming. Many celebrities also love to wear them. Gemstones are adored by many individuals because it coveys an impeccable reflection of an immaculate picture of a simpler time, one that we may use to hear from our grandparents and talk about their reminiscence. At that time, life was simpler because there were no consistent pings of technology that kept everyone hooked to their cell phones. Gemstones customarily feature out the styles favoured in the past and negotiate with a staying power that seems like unbothered by passing fads. Do you know what exactly a gemstone is? A gem is a precious stone that holds exquisiteness, sturdiness, and rarity. Gemstones – precious or semi-precious – are cut and polished to be utilized in jewelry. Majority of the gemstones are composed of minerals, which occur naturally in the earth. Minerals have a distinct chemical composition and a clear atomic structure. Many of us are not aware of the difference between the diamond and gemstone. Gemstones may be cut and refined or remain in their natural form and they may or may not be used in a piece of fine jewelry. In older times, “precious stones” denoted to diamonds, emeralds, rubies, and sapphires, while “semi-precious stones” comprise of everything else. Precious is referred to as signifying a higher relative value. Today, these concepts have altered a lot. Who doesn’t adore a stunning gemstone, whether situated in a piece of jewelry or loose? Even in the natural state, gemstones look enticing and visually-alluring! There are various places where you can acquire a gemstone or a piece of jewelry, and there is quite a range of prices. There are some really convenient tips to keep in mind when you are searching for gemstones on your own or looking at them in jewelry. Getting your hands on the wrong gemstone is the last thing that one would ever like to experience. First, you will want to complete your homework and conduct thorough research ahead of time. It is always enjoyable to just enter into a beautiful shop and look around. It is always advisable to go with some knowledge about exactly what you want in a specific gemstone. Go equipped with questions and acquire a feel for how open and friendly the gemstone retailer is. A trustworthy seller will be happy to answer all your questions. He will equip you with the most relevant answers to your questions. Every genuine seller wants to build the bridge of loyalty so that you bring repeat business to them and spread a good word about the store. Don’t be scared to inquire around for a reliable dealer. Many people have their family or old jewelers they trust very much, and are happy to give the name along. This is a good way to begin the process of buying a gemstone ring. You don’t want to trust just anyone when it comes to such precious and expensive thing. A potential seeker will wish to be looking for a genuine store. If you search, you can easily end your quest by finding a jeweler that will guarantee their gemstones via equipping you with the certification. This is great because they can be assured of what you are receiving, even if you are paying a little bit more than your concerned budget. Many places, non-profit gemological agencies will generally come in and conduct some testing of the stones. They can test, rate, and certify the unset stones and this can be of useful help to a jeweler and is customer base. It is good to inquire about returns too. Some jewelers may have a policy which allows the buyer to return a stone within a year. Buyers will wish to observe their gemstones up close, and maybe even under a special microscope. It is suggested to find a jeweler that allows viewing a piece under their microscope to notice each detail of the stone itself. The imperfections present in the gemstone informs you about the fact that it is an exclusive piece. Its imperfections add characters to it. Imperfections are generally quite prevalent because we are getting the real stones from Mother Nature, not cut glass! Glass can be pure looking and impeccable, but they are not gemstones of course. One can also find nearly perfect stones out there, but you will have to pay a bit heavy price for them! You can buy a loose gemstone and get it placed in an impeccable setting of your choice. The settings can appear a bit weird without their stones, but ask your jeweler if they will show you what they have. Your personal tastes also matter a lot for such quintessential and generally luxurious items. Do you want Natural stone, or treated stones? The broad array of gemstones out there is just so confusing for a buyer. Do you know gemstones often have been treated with heat, dye or have been created in a lab? These look very pretty and explicit, but you will still want to be aware of what was done to the stone and can ask what it looked like before the treatment. Jewelers can put stones through irradiation, heat, dying or coating to make the stone look even dazzling and tantalizing than it is. Treatment has the potential to enhance the whole look of a gemstone and fetch out amazing colors. A gemstone’s depth of tone is an imperative aspect that affects a gemstones shade. The lightness or darkness of a gemstone is known as its tone. Generally, all gemstones, even expensive ones, consist of inclusions. Flawless gemstones are very rare to found and can generally wreak havoc on your bank balance. Most gemmologists suggest that imperfections are equipped the gemstones with color and distinctive personality. Some gems, like emeralds, are generally treated with colorless oil, wax or resin to minimize inclusions that reach the surface of the gemstone. In contrast to diamonds, there is no favorable and designated cut for colored gemstones to supreme brilliance. Though, a well-cut gemstone is one that gives the most unfluctuating hue, exposes the smallest inclusions, and improve the gem’s color. When a gemstone is cut efficiently and accurately, the obtained color is rich and saturated because the light is appropriately reflected. When cut too shallow, the stone appears lighter in color because of the light outflows, rather than reflects off the surfaces. A stone that has been cut too deep looks dark because the light gets lost within the stone, rather than reverted to the eye. Gone were those days when people had to stick to traditional designs when it comes to buying rings. Nowadays, you can design your own diamond ring. Whether you want a ring with a gemstone in it or a ring consist of diamonds, all you have to do is inform the jeweler about your preferences. In addition to this, at the present time, one can get a ring with a certain budget. 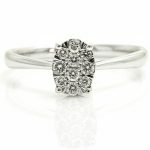 Before going to a store, make sure that you are buying a ring from a reputable store. It is one of the most important things that every buyer needs to remember this. Do not go to such a store that looks shady. If the store is having a rock solid reputation, then you will get peace of mind that your money is going in the safe hands. If you are buying the ring online, then make sure that you are also getting ‘return and exchange services.’ These services allow a buyer to return the product in case of an issue. Exchange service also acts as a savior. Sometimes, the ring that you have ordered doesn’t fit properly in your finger which allows you to get bigger in exchange of smaller ring. Today’s generation craves for perfection. When it comes to buying the perfect ring, majority of the youngsters want the ring that reflects contemporary design. Nowadays, the majority of the jewelry stores allow the seekers to design their own ring that fits perfectly within their budget. Now, buying a perfect ring won’t be a nerve-wracking task.